Share the post "Album review: HOW WE LIVE – Dry Land (Steve Hogarth)"
David Randall chatted to Steve Hogarth about his career in July 2014. In this hour special, tracks include How We Live and Marillion, plus Steve’s solo work. ‘How We Live’ is an important part of the connection between Steve Hogarth and his ultimate band destination, Marillion. Not least because it features one of ‘millennium’ Marillion’s best tracks ‘Dry Land’ which was included on the second Hogarth album ‘Holidays In Eden’. Included here as the title track it doesn’t change much in the hands of Los Marillos. 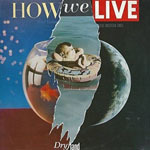 After having spent some time with The Europeans who made two studio albums (in 1983/4) How We Live – together with fellow European Colin Woore – was more accessible and less obviously ‘eighties’. When I chatted to Hogarth in 2014 he expressed regret that How We Live wasn’t given a greater chance and feels some guilt in his musical relationship with Woore. A year later he’d already been grabbed by the Marillion men. There are some sublime moments that will be lapped up by listeners who enjoyed the early Hogarth/Marillion albums. Only constrained by a late eighties pop vibe in the production (evidenced on ‘The Rainbow Room’, ‘In The City’ and ‘A Beat In The Heart’), the overriding aspect is the strength of songs such as ‘Working Girl’, ‘Games In Germany’, ‘India’ and ‘Working Town’. Hogarth is always very good at conveying emotion in his vocal and none more so than the wonderful ‘Dry Land’ a tale of cautious, unrequited love. This entry was posted in ALBUM REVIEWS, ALBUM REVIEWS (Mobile), All Posts, Reissues and tagged album, Colin Woore, Dry Land, eighties, How We Live, Marillion, pop, reissue, review, rock, Steve Hogarth. Bookmark the permalink.